Ever heard of Fly Strike? I hadn’t, until I had to cull my tom. It is especially prevalent in rabbits and The House Rabbit Society gives a good explanation of it. One day we noticed our tom had a wound on his wing; which we cleaned and he seemed fine. 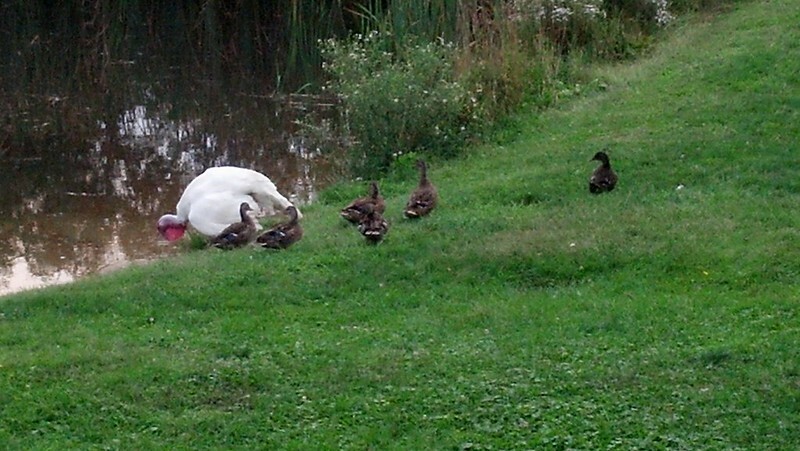 I took a pic of him chilling with the ducks a couple of days later and I noticed a little spot on his rear; I thought it might have just been poop. The next couple of days were very warm, humid and raining. When it rains, the birds usually just hung out in our gazebo and since I was focused on other priorities; I didn’t get to spend any time with them. I noticed tom’s back was dark, but thought it was just from the dust-baths and the rain. I was at work a day later when my daughter called me and said Dad, you need to come back to the house. So I went back and there was tom sitting, with his back covered in blood. So I started lifting up his rear feathers and his whole back from his tail up to almost his neck was covered with maggots digging into his flesh. We grabbed some warm water and started rinsing off the maggots and trying to pick them out. Chunks of clotted blood and flesh were falling off him. By this time the farm store had closed and I couldn’t get anything to try and help. So I did the best I could till morning and set him on the roost. The next morning I woke up at 6 a.m. before anyone else and walked outside. The three hens were eating out of the feeder, but tom was nowhere to be seen, so I called for him and he slowly came walking out from under my Dad’s cabin. He looked like a zombie. His back was covered with open wounds, more maggots and most of his feathers were in shambles. He tried eating out of the feeder and the hens started attacking him, so he came up onto the porch to sit with me; just looking for some bread. 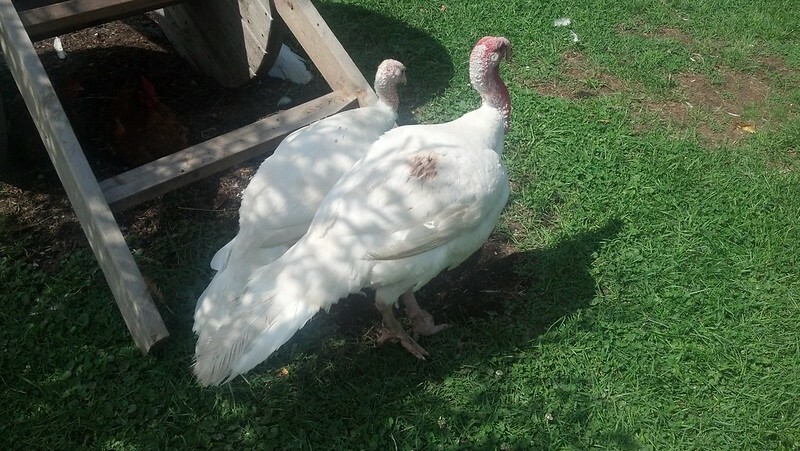 If it was earlier in the season, I probably could have nursed him back to health, but we were scheduled for processing the turkeys the following week and with winter coming on; there’s no way he would have made it due to the loss of feathers and his feet issues. So I did what needed to be done, I killed him. After it was finished, I pulled his feathers apart to be able to see the true damage. His whole back was pretty much gone. I think it started with the one little spot, he pecked it, some blood flowed, flies laid their eggs; which he started pecking at more and then the other birds all started attacking it as well. The dark spot on his back I had thought was from the dust baths, was probably actually blood. So due to my lack of knowledge, this bird that I loved and thought was cool as hell suffered for several days as he was being eaten alive by maggots and pecked by other birds. 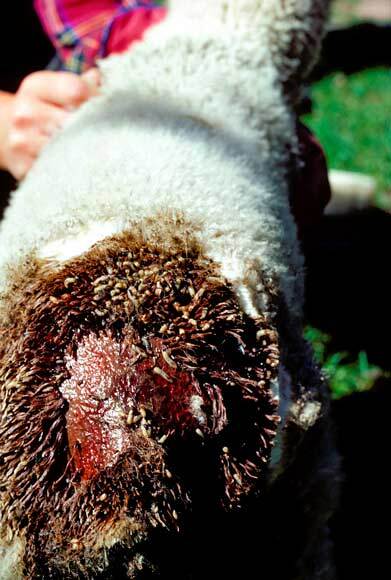 It’s called fly strike and can happen to all animals; this is a lamb affected by it. 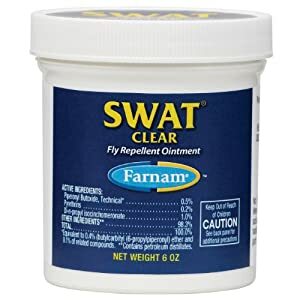 They make this product called swat to help deal with it. If I had known about it I could have saved him, but he died due to my lack of knowledge, and it’s killing me. So sorry for your loss. Thank you for sharing the lesson to hopefully have others avoid it. I have been where you are. The best and cheapest way to deal with this is kerosene. Yup. Kerosene. When I started raising sheep 25+ years ago we had a lamb that had a bad dock and was fly blown. I called my mentor and was given the instruction to set it in a pan of kerosene. If there were grubs under the hide use a spray bottle to spray up into the wound. 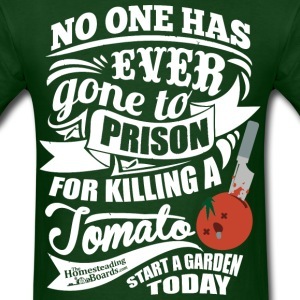 It sure works without poisons like lindane. I used to carry a bottle around with me in my shearing kit. Also, my vet told me what you and I have experienced is “fly blow”. “Fly strike” happens when a larval fly bot works it’s way out of the host after the fly egg is ingested. I hope you don’t have to experience this anymore. Thanks for the tip blacksheep!